“ddbexpress Engineering & Software” provides specialized software, ‘Delphine Express’ for Construction Engineering domain. ‘Delphine Express’ works especially for the treatment of Costs, Budgets, as well as Control and Monitoring of Work. Your work ‘supporting the placement of 3D dimensions manually as well as automatically, for existing Eyeshot based software.’ was perfect. I am happy and I hope to continue working with your team. Thanks for your support.” says, Gustavo Vigo, Owner- ddbexpress Engineering & Software. Technologies: Eyeshot API’s, IFC file Format etc. 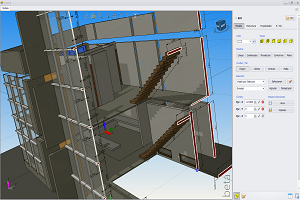 Multiple clipping planes and Manual and Automatic dimensioning of features on clipped sections. Writing modular code so it can be integrated quickly into existing software’s large code base. Adding 3D dimensions in the Eyeshot viewport. Decide direction and distance from selected end points and orientation of the dimensions considering viewing direction of camera. Determine capping edges generated by clipping plane and implement intelligent algorithms to add dimensions automatically and these are placed elegantly. ProtoTech’s expertise in the Eyeshot APIs and 3D rendering helped ‘ddbexpress Engineering & Software’ to implement the feature for end users within the scheduled time.